Dr. Karackattu's chemistry students investigated two gas laws in the lab, both quantitatively using instruments and qualitatively using marshmallows. They observed Boyle’s Law, which defines the relationship between pressure and volume, as well as Charles’ Law, which relates temperature to volume. Students rounded out the lab session with a sticky, sweet treat (S’mores) courtesy of Charles’ Law! 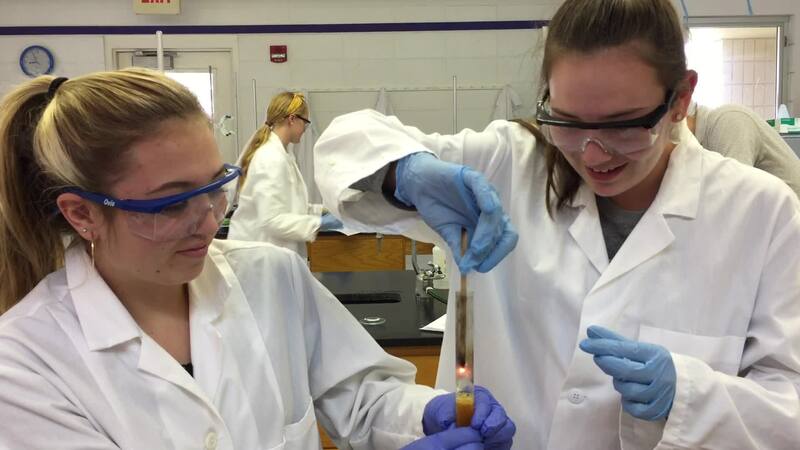 Dr. K's chemistry students carried out a decomposition reaction, which generated oxygen gas. Several of our Eagles enjoyed an alternative Spring Break service learning trip to Costa Rica! Sixteen students worked with Ecology Project International to learn about conservation. They focused on the endangered leatherback sea turtle and relocating and protecting its nests from poachers. Ms. Wilson and Sra. Serrano chaperoned the trip. Our Upper School students had a very successful Great Day of Service on Wednesday. They went to various local businesses, helped out, and made the community even better. Way to go, Eagles! The College Counseling Office is now scheduling family college conferences with juniors. Any students who have completed the Do What You Are and Student Questionnaire/Survey are welcome to schedule their family college counseling conference. These meetings will take place either during the school day or after school. To register for the SAT Subject Tests, please visit HERE.